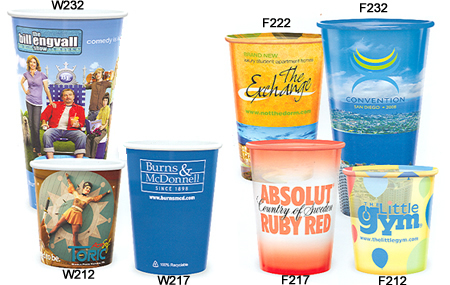 These Full Color Reusable Plastic Drink Cups promote your image with incredible detail and clarity. Your design is printed on White or Clear Plastic Cups that are reusable, recyclable, and top-shelf dishwasher-safe. The Cups are available in 12, 16, 17, 22, and 32-ounce sizes. The minimum order is just 250 Custom Cups for White Full Color Plastic Cups and 2,500 for Clear Full Color Plastic Cups. Production time is about 10 business days. It's easy to have your own Full-Color Custom Drink Cups. Simply call 1-800-233-0828, and then submit your camera-ready artwork to graphics@kardwell.com (you may also mail your artwork).